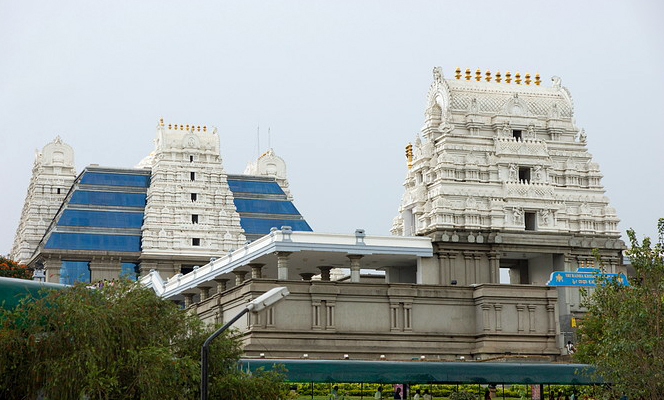 The ISKCON temple in Bengaluru is one of the largest ISKCON temples on the globe. It was completed in 1997. Before that, ISKCON Bangalore had been operating from a rented house. This particular ashram is part of the larger conglomerate of ISKCON temples/ashrams established throughout the world. The ashram is located on a 7 acre hillock in northern Bangalore. The spiritual experience is centred on Lord Krishna-worship, and the teachings are based on the Vedas and Bhagavat Gita. The temple boasts of a unique design that incorporates glass and gopuram (tower-like structure). The gopurams have gold-plated, exquisitely designed apexes or kalashams. There are around 100 full-time brahmachari devotees and 30 full-time grihastha devotees at the ashram at present. Other than these, the ashram also welcomes visitors, who want to stay for short terms at the complex. The principle deity in the temple is Radha Krishna. There are also other deities – Krishna Balarama, Nitai Gauranga, Srinivasa Govinda, Prahlada Narasimha, Hanuman, Garuda, Srila Prabhupada. Srila Prabhupada is the founder of the International Society for Krishna Consciousness (ISKCON). The main festivals celebrated at the ISKCON bangalore are Geeta Saptaha, Navaratri Sangeetotsav, Sri Brahmotsava, Sri Krishna Janmashtami, Sri Krishna Leela Sangeeta Nrityotsav, Sri Purandara Saptaha, and Sri Vaikuntha Ekadashi. There are two convention halls and a catering service suitable for conducting marriage ceremonies, upanayanams, or samskaras. Dwarakapuri Hall – can seat up to 470 people in the main hall and 325 in the dining hall. Mathura Hall – 150 people in the main hall and 100 guests in the dining hall. The Donor Care Centre is a special cell, which dispatches monthly magazines, invitations to special pooja, handles queries, requests, etc. of donors and patrons. There are around 70 rooms available in the guest house within the complex. Many of the rooms have private dining facility. There is parking facility available for private vehicles. A typical day starts at 3.34 am with the jagarana seva and mangalarati. The ceremonial circumambulation of the temple by the deities in decorated palanquins completes the sevas/poojas; and the deities are offered shayana seva at 9.00 pm. The darshan is only till 8.45 pm. There are daily classes on the Bhagavat Gita at 8.30 am. Lectures given by Srila Prabhupada are scheduled on Mondays and Saturdays. On other days, senior missionaries give lectures on spiritual topics. On Sundays, a number of lectures are given in different languages – Tamil, Hindi and Telugu. Additionally, there are classes in English or Kannada on Sundays. One of the well-known initiatives of the ISKCON movement is the The Akshaya Patra Foundation. This is a collaboration with the Government of India to provide mid-day meal to children studying in Government schools and Government-aided schools. The Goshala or cow protection is an important aspect of ashram life. Value Plus is an educational programme run by the ashram in schools to inculcate certain positive values in the future citizens. The FOLK (Friends of Lord Krishna) programme is targeted at the youth. It involves a gala of spiritual classes, music, dance, and prasadam (food offered to Lord Krishna) held on Saturdays and Sundays. Krishnashraya movement is a home-based programme aimed at rejuvenation of spirituality. The Sri Krishna Kalakshetra offers artists, musicians, dancers an opportunity to showcase their talents in conjugation with offering devotion to Lord Krishna. Every Friday, Vishnu Sahasranama Parayana is conducted at the complex. Regular Bhajan sevas are held on Saturdays and on Sunday mornings Sri Krishna Bhakti Sangeeta Sevas are arranged. The ISKCON ashram is on Chord road in Rajajinagar. A visitor can take a bus to Rajajinagar 1st Block or Mahalakshmi Layout entrance from the Kempegowda Bus Depot. From Mahalakshmi Layout the distance is about half a kilometre, and from Rajajinagar 1st block it is around 800 metres to the ashram. One could either walk or hire an autorickshaw. The autorickshaw ride will cost around Rs. 20 to Rs. 30. If one hires a taxi from Kempegowda the distance would be around 7 km and the cost would depend on the ongoing meter charges for the distance.